One great thing about this job is the adventure involved and the people you meet along the way. I always say that with documentatry filmmaking you get to experience a different walk of life with every interview and new place along the way. "Shades of Gray" took me to sunny Key West, Frozen Minnesota and to Cleveland, Ohio where after the interview I got to see Roger Clemens take the mound for the New York Yankees. 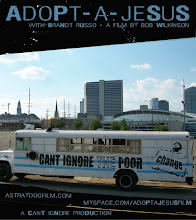 With "Adopt a Jesus" I went to the streets of Nashville, Shreveport and Houston to name a few and met folks who go unnoticed for the most part by our fast paced world. 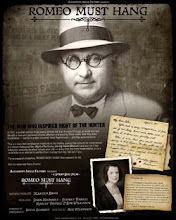 Next up, Romeo Must Hang took me to Buffalo, New York, Independent filmmaking is always an adventure. After finishing up my 40 hour work week at WVPBS at 7pm on Friday evening we took to the road. Steve Schmidt and I were headed off to Erie, PA where we would stop for the night. On the way we listened to some of the tracks that Jeremy had cut for the film, the different perspective you get listening to music at varying times of the day is interesting. Suddenly a Angelo Badalamenti quality crept from the tracks that I had listened to months before. Some filmmakers prefer to have a score cut to the finished film but I like to have a sound in my head while I'm gathering my interviews. The documentaries I've done in the past are shaped by the soundtrack that I lay out in advance and it allows me to construct the world in which my characters live. The next morning we finished the trek to Buffalo, NY where the mission was to interview David Schmid, author of "Natural Born Celebrities." We met David at his house and followed him to his office at the University of Buffalo where we sat down for the longest interview I've conducted or been a part of. Steve also said it was his longest he had been apart of. I prefer to call my interviews conversations, I don't write down any questions to take into the interview, this feels forced to me. I do have a specific outline in my head to which I will attempt to cover during the conversation but what happens in-between those bullet points is anything goes. The most important thing going into a "conversation" is you've got to do your homework. You've got to know first of all about the subject and characters in your film. Second you need to know about the subject your about to sit down with to have a conversation. The interview went more than well, it was the kind of interview that takes a story to the next level. 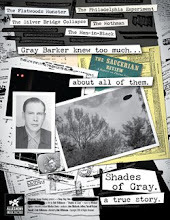 Each film has one or more, Shades of Gray had multiple interviews of that nature, hopefully "Romeo" will turn out to be as fruitful. My goal with David was to paint broad strokes with my questioning to generate deep discussion, I wasn't concerned with the details of the Powers story at this point. By this I mean rather than asking What Powers personality was like, I would ask Why is it every time a serial killer surfaces in a neighbor hood everyones reaction is, Well he was such a nice quiet guy. The scary thing is these monsters are just like you and I... average unassuming people. That is the level of conversation I was trying to get, and I more than got it. Thank you David. After the interview it was off to the Anchor Bar in downtown Buffalo. Its a contentious issue but the Anchor Bar claims to be the place that invented the Buffalo wing, there is another place in town that claims the same. I'm not much of a wing fan but being a fan of history I ordered up some, I must say it tasted like a Buffalo Wing. At this point it's 8pm and when making a film business comes first but it's also important to have some fun along the way. With this you see and do things when time allows, this means a night trip to Niagara Falls and across the border to Canada. I've never been to the falls and even at night it was impressive. It was nothing like I had cooked up in my imagination, I pictured a secluded area lot of forestation and a giant waterfall with a guy in a viking hat riding a barrel to the bottom. I hadn't dream up the towns and casinos that had grown up on each side of the border. It was a short lived trip because it was 5 degrees on the U.S. side and it was -15 across the border. It was cold but we didn't have to give it much thought, we were heading back to West Virginia in the morning. Canada here we come. At the border they didn't seem too keen on us bringing $8000 worth of gear into Canada. I told them we had carried the sensitive gear into the hotel and were just too lazy to carry the rest. "What do you do for a living? ", asked the border guard as he searched the car. "I'm a Filmmaker," I said. "What is your film about," he said. I replied, "Actually a Serial Killer." The second guard laughed and said, "Did he do it?" To which Steve replied, "Hell yeah he did it." "Where you guys staying?" "Buffalo," I answered. "I wouldn't leave my stuff in Buffalo either," he said. After the car was searched it was onto Immigrations to get a background check to be cleared to cross the border. Once in Canada we walked beyond the tourist traps to a little bar with curling on one screen and hockey on another. After a few hours in Canada it was back to the U.S. where once again we were searched crossing the Peace Bridge. The guard asked mostly the same questions with one exception. "What did the Canadians say when you brought all that equipment across the border?" I didn't have the heart to tell him. Labels: "Adopt a Jesus", "Buffalo NY", "Canada", "Niagara Falls", "Romeo Must Hang", "Shades of Gray"
So that's why they call it a "Buffalo" wing - love learning stuff like that, also being a fan of history. Sounds like a fun trip and another interesting project. Oh yes, a splendiferously amusing tale.